This article is credited to Mats and rightly so as he is the lead and main author – I added just a little detail and colour. He and I share virtual knowing glances at each other from time to time when disputes over L144 flare up on social media. That did, and does, also highlight the need to better explain the background to the whole issue. It's worth also mentioning that I asked Mats to capture all of this data and musings so that the background to the mystery of the disappearing and reappearing L144 could be pulled together in one place. I'll hand over to Mats now to explain more. There are some fish that are hard to figure out what they accurately should be called. Sometimes we don't know where they came from. Identification can be made harder if they are bred in captivity and the link with their wild origins is broken. In the case of many plecos, misunderstandings of how the l-numbering system works is another complicating factor. The fish commonly sold as L144 these days suffers from all these issues and more. So, this article will explain the situation and the position that Planet Catfish takes on the subject with the aspiration of making it all a little clearer. To do this perfectly, we'd need a time-machine and a few bus-loads of "secret agents" that can watch who comes and goes all over Europe. In reality, the best we can have are just well kept records of who bought the original fish, who they sold them to and so on. Let's make one thing very clear. For this article at least, L144 means a single male fish imported in the early 1990's to Germany from Paraguay - this fish had a unique genetic defect that made it yellow. The genetic defect is called amelanism or xanthism. This single male was bred with female(s) imported at the same time, and the resulting offspring is what we should call L144. Remember that when a new L-number is published there are only two common factors. Firstly, it is based on a picture and secondly, it is published in the German magazine DATZ. Optional extras are, hopefully, a location of capture or export – which can be very different and often misleading. So a fish that looks very similar, but is from a different location, is often considered a different L-number. Hence, widely distributed fish, such as Peckoltia sabaji, can sometimes have a handful of L-numbers. And to make a clear point here, if we take a male L075 (P. sabaji from Rio Para in Brazil) and a female L124 (From Puerto Ayacucho on the Orinoco river), the offspring aren't L075 or L124, it's a new form that doesn't have an L-number but is not a hybrid. Well, actually it's an intra-specific hybrid, but in the fishkeeping world when we say hybrid we mean that the father is one species and the mother another. The offspring are not hybrids in that sense and they are the same species as both parents. The original photos of L144, show a pale yellow fish with pale brownish blotches. There are white tips to the unpaired, rayed fins. The new fish is much brighter coloured, almost orange, and doesn't have pale brown markings. The original L144 has branches on the "bristles", where the current new fish does not, or at least very few. It appears that the new fish has a smaller adult size. Much is being made of blue vs. black eyes, whether the fish was bought from a particular country or source. Unfortunately, none of these appear to be particularly useful keys. In particular, the area around the eye on the original L144 is more grey/brown than blue (when compared to the actual photo as published by DATZ) This is the same fish as pictured here and on our species entry for L144. It's not significantly different from other forms of Ancistrus - it just shows up more on these pictures because the fish is a different body colouration. So, instead we have to rely on historical records and people who were around at the time. The origin of this article goes back to a UK Catfish Study Group convention some time back in 2010 or so, where Mark Walters had asked Ingo Seidel to look at his fish that looks similar to L144. Ingo suggested that this was not L144, but a variety bred in captivity of unknown origins. Now, the imprecise "unknown origins" is precisely what makes it so difficult to make the situation clear. The pointers Ingo gave for telling the difference, are those listed above, along with the more subjective "L144 is an ugly fish, Mark's fish are pretty". So what do we actually know about the "new" fish that looks sort of like L144? Rupert Collins carried out a DNA test on one and found that the mitochondrial DNA matches that of the common bristlenose (Ancistrus cf. cirrhosus). This means that the maternal ancestors (ancestors on the mother's side) of the fish are indeed a common bristlenose. This is further evidenced by the fact that there are long-fin varieties of this "new" fish. Unfortunately, the DNA test doesn't show anything to indicate the paternal ancestors. We would love to see the results of such a test, but right now, none is available. The fact is that to conclusively prove or disprove the relationship to the original L144, we'd need its DNA too - and nobody has that original fish or its offspring. We believe they were originally bred in the Czech Republic where there is a decades old network of professional fishbreeders. Perhaps more of this story is known amongst this community, but if it is, it has not been shared with the wider world. My own personal opinion is that another amelanistic fish was imported, probably from a different region than the L144, and this fish was bred with common bristlenose; the identification of which are also something of an epic fishy tale. Another possible explanation is that it is truly just a captive bred colour variant of the common Ancistrus - in other words, a mutation that occurred in one of the thousands of offspring that this species produces every week. It's very hard to say which of these possible explanations is the more likely and unless the original breeders of the currently available fish tells us, it's unlikely we will ever know for sure. We are quick to dismiss many other Ancistrus that are sold under incorrect names and l-numbers. Why do we not do that with this l-number? 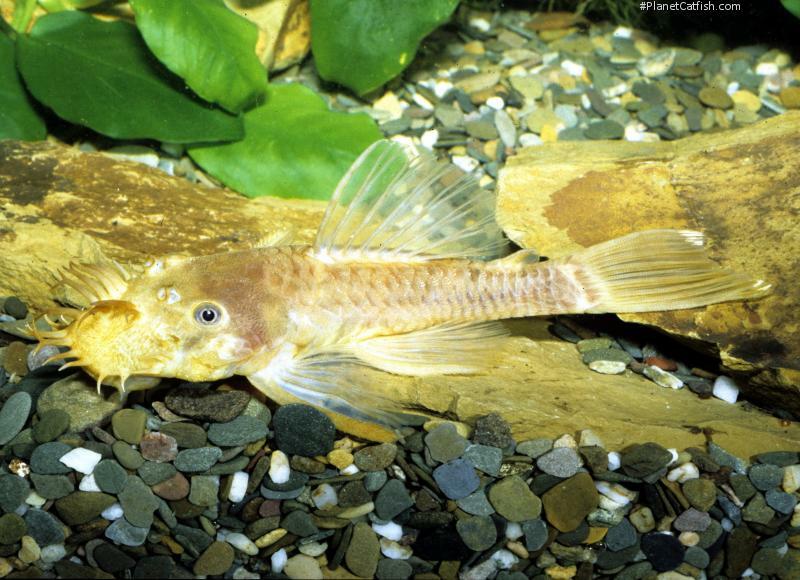 They do persist, we still see Ancistrus temminicki and L059 for example persistently misused. It is because L144 has become a tradename. Some might argue that is all an l-number is – yet those with a deep knowledge of the system will tend towards it being more than that. So, the L144 you see for sale are as much an L144 as a red tail shark is the lead protagonist in the movie Jaws. It is likely most aren't bothered in the slightest that their L144 aren't what the l-number system defines as L144. As the simple l-numbering system mimics Linnaeus 's complex system of classification and indeed as Ancistrus used to be known as Xenocara, we also have L144 the l-number and L144 the tradename. While it is confusing to have the tradename that everyone keeps and the l-number that (probably) nobody has, at least in writing this article "the truth is out there". General Remarks L144 is a one off import - the one male fish that came from Paraguay was at the time bred together with females imported at the same time, and then crossed back to their own siblings to lock the genetic defect that causes the yellow colour. These fish died out in the late 1990s as far as anyone can tell. The fish that is now sold as L144 is a different form, most likely based on Ancistrus cf. cirrhosus. This form resembling L144 can be found under as Ancistrus sp(4). Distribution Imported (once) from Paraguay.